e just found our next Mountain renovation and will be starting as soon as one million decisions are made. The home has great space and potential but, extreme creativity is needed for this future lovely. I am posting a few pictures of the rooms as they are now–more later. Take a look, and tell me your creative ideas! 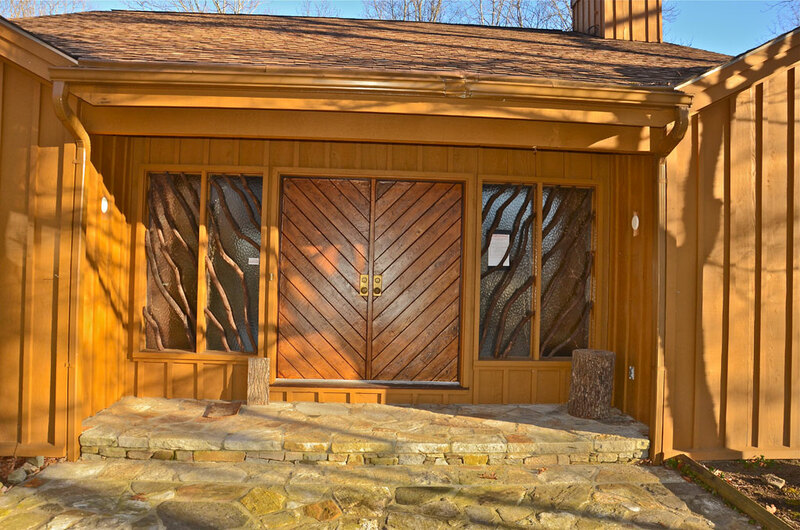 Front entry–diagonal wood doors, shower glass windows with locust log trim. What can I say. The Living Room has great potential and lots of stone. And don't forget the Faux Stone Arches–reminds me of a certain restaurant. 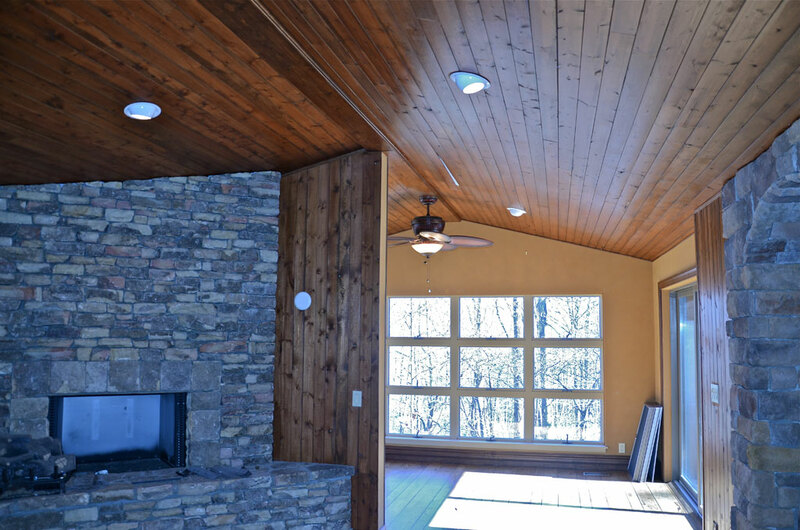 The light is great in the Family–Room area of the house. I think this area will be fantastic after the renovation. 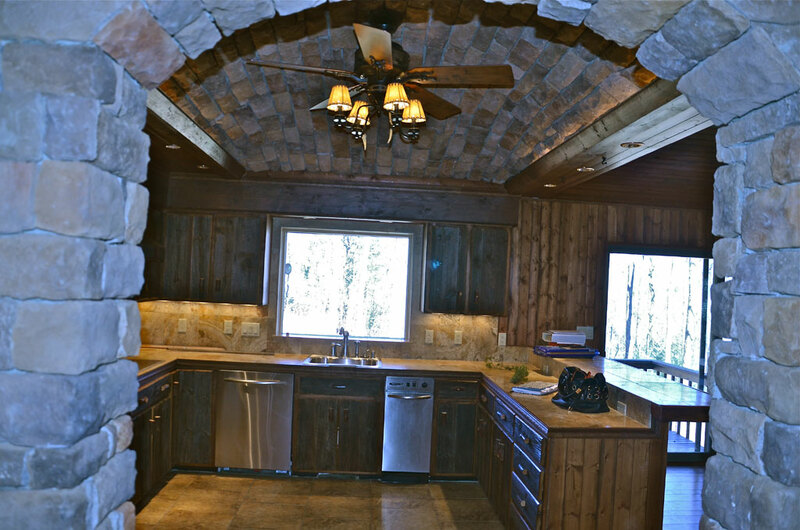 The kitchen has a Fantastic view but, is really dark–more Faux stone. Fantastique potential here! At least you won’t have a Mount LisyParker to deal with. Whatever you do, don’t destroy the stone wall with arches. I know what I’d do, but this is your Baby and you must make the decisions. I have every confidence you’ll do her proud! Oh my goodness that faux stone gave me a good laugh! I cannot wait to see what you do with it! faux stone has to go! looks like a fun project. does the good lookin’ guy come with the house? What a super afternoon on Saturday! A celebration of your new home! It was such fun! Now the design begins! You sure received good info, as none of us were quiet about what we thought. Keven Hawkins is an absolutely amazing person and his ideas are fabulous! Let us know what you decide, it is going to be a wonderful home. Where do you get your energy? 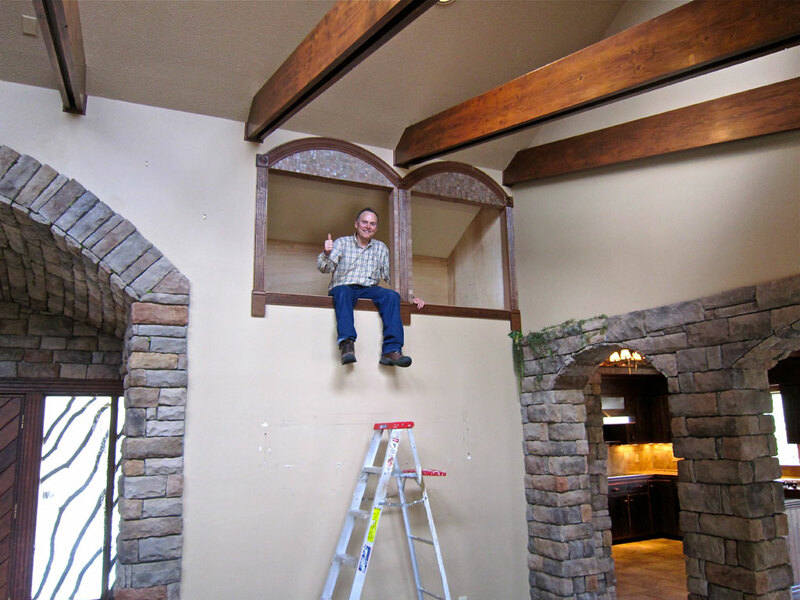 Renovating your home in town and now the jewel in the mountains! You are amazing. Can’t wait to see what you do with the mountain home! My first impulse is white paint! Can the faux stone be painted and look good? 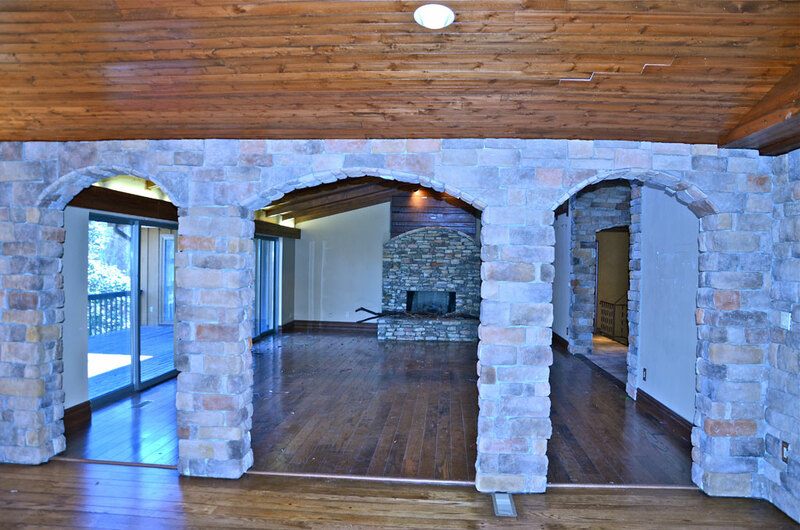 I think I would remove and replace the stone arched way with wooden columns…. I would remove the upper cabinets in the kitchen and replace with either open shelving or new cabinets to the ceiling with glass doors in light color. the soffit would have to go! you could paint or cerise the bottom cabinets and then tile the sink wall and have open shelving or new cabinets. I would also wall up(remove) those two arch openings in the family room if possible, do they open for a reason? without being in the actual space hard to tell but it seems in the picture that the beams feel heavy for the room, are they structural or could you remove and do a pecky cyprus ceiling? or just paint them? 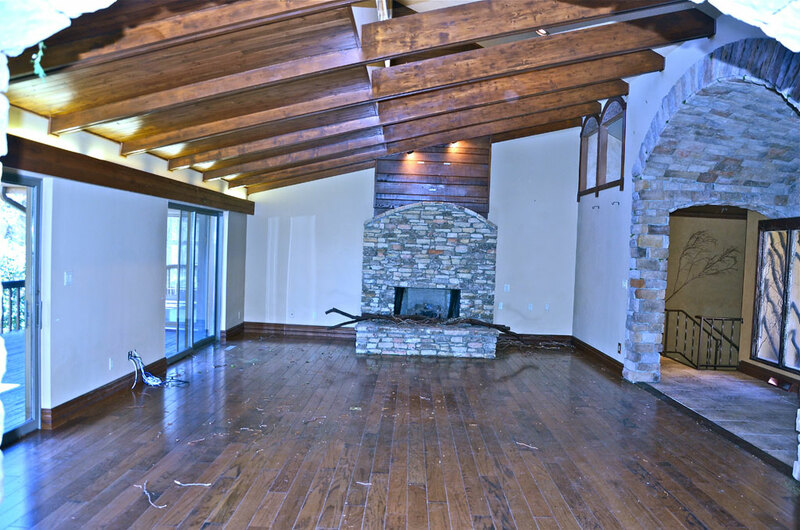 i could picture a built in reading niche on the left side of the fireplace and perhaps a built-in on the right side to with bookshelves & house a tv? the room looks large enough to have a couple of seating areas? what an awesome house! are you sorry you asked for suggestions? cannot wait to see what you do!!! it will be fab! did you find my other blog Lisa Mende design? I cannot believe you found Woven in My Soul blog. (that was a blog I started after I lost my son, that no one really knows about!) didn’t mean to send you there….